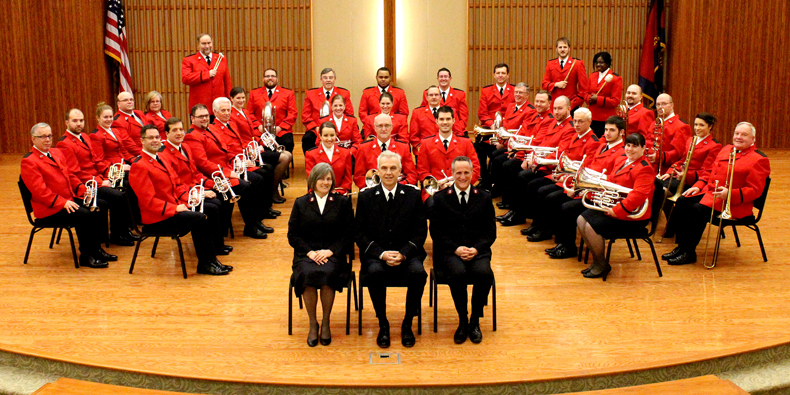 The Montclair Citadel Band (Bandmaster Charles Baker) recently visited Red Bank Corps, Red Bank, New Jersey. This is one of the finest corps bands in the United States. Unfortunately, attendance at the concert was light with just over 60 people in the audience. But those who were there were completely blessed by the talents of the members of the band. The program included varied items. The band played traditional festival marches such as Crossbearers (Martin Cordner), Marche Militaire Française (Camille Saint-Saëns, arr. Michael Kenyon) and Goldcrest (James B. Anderson). These were contrasted with contemporary Christian and “big band” arrangements that had people dancing in their seats and in the aisles – Soon and Very Soon (Andrae Crouch, arr. William Gordon) and Trumpet Solo Flourish (Paul Sharman), the latter featuring Deputy Bandmaster Michael Baker. A meditative mood was evoked with the euphonium solo Comfort My People (Robert Redhead) offered by Emilee Bennett and Make Me a Channel of Your Peace (William Himes). Mark Baker presented the trombone solo The Eternal Quest (Ray Steadman-Allen), which also has a strong spiritual message. Items in an classical style completed the selections, including Farandole from L’Arlesienne Suite No. 2 (Georges Bizet, arr. Denis Wright) and Dean Goffin’s masterpiece Symphony of Thanksgiving. Major Larry Ashcraft, corps officer at Montclair Citadel, shared words of meditation and Zachary Hodgson played Begin the Day with God (Eric Ball) as an offertory. Proceeds from the evening were credited to World Services. Upcoming major engagements for the Montclair Citadel Band include a trip to London, Ontario, Canada at the end of October 2013 and two join concerts with the New Jersey Symphony Orchestra, 14 December 2013 at the NJ Performing Arts Center, Newark, NJ and the State Theater, New Brunswick, NJ on 15 December 2013. This article was posted in News and tagged benefit, Charles Baker, concert, David Hulteen, Emilee Bennett, Larry Ashcraft, Mark Baker, Michael Baker, Montclair Citadel Band, New Jersey, Red Bank, Red Bank Corps, World Services, Zachary Hodgson on 3 October 2013 .